ProStars v2.0 | you like a da juice? 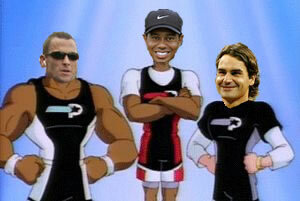 With Lance Armstrong unretiring, Roger Federer winning the US Open, and Tiger Woods set to return from injury next year, it looks like my dream cast for ProStars 2.0 may be set to continue its run. Well actually, my dream cast involved Kobayashi in the peak of his awesomeness…maybe he and Chestnut will make some cameos. Also, the original cast of Jordan, Gretzky and Bo Jackson should be involved as mentors for the new generation of crime-fighters, like in Batman Beyond. I really just want to see what my co-blogger can do with the artwork here, after a solid job with the Varsity Patriots. But since this is supposed to be a fantasy sports blog, I’ll mention that if I were to use athletes from fantasy sports as the Prostars, which I shouldn’t, since no one is as dominant in their sport as the original trio, I’d go with LaDainian Tomlinson, Chris Paul and Albert Pujols.